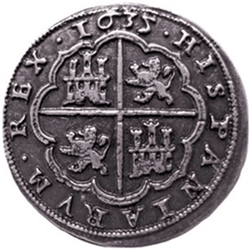 Our Piece of Eight is a replica of the real of silver (Piece of eight) coined during the reign of Felipe IV in 1635. More recently the piece of eight was the center of discussion in the movie Pirates of the Caribbean: At Worlds End. They needed to collect the nine pieces of eight from the nine pirate lords who bound Calypso to her human form. They needed to rejoin the original nine to release her back into the ocean of her home.